I got around to dyeing more wool felt last night. This is the first time I tried using Kool-Aid. It’s kind of “kool” as the colors are already mixed up and there is citric acid already in it so it’s supposed to work without having to add vinegar. The acid opens up the fibers to the dye. 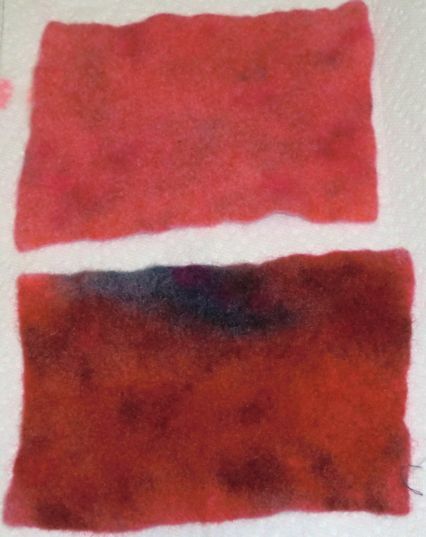 I still soaked my felt in lukewarm water and vinegar prior to dyeing to open up the fibers and saturate the felt. Using the Kool-Aid crystals made it really easy and probably a little less messy. After sprinkling the Kool-Aid on my felt, I sprayed it with some water to wet the crystals and disperse the color. Then I steamed my pieces. I have a big steamer that I bought eons ago when I was doing machine knitting. It works great for setting the dye. I steamed the pieces for less than 30 seconds, then took them over to the sink to wash out the Kool-Aid residue, along with any dye. I was totally surprised when no color came out. None at all. While washing, I felted my pieces at the same time by rolling the felt into a ball and rubbing the ball between my hands. Then I laid them out to dry. Here’s the results. I’m still trying to figure out how to get purple. My attempts haven’t even come close. I did get some purple on the bottom pink piece at the top but I don’t know what I did. This is the piece I was trying to use up the Kool-Aid packets I already opened. Guess it’s back to more experiments…..